Jakarta, June 5th 2015 - Archipelago International and PT. Marindo Surya, represented by Mr. Sugiarto Alim, President Director of PT. Marindo Surya, officially marked the grand opening of the new Quest Hotel Surabaya on 3rd June 2015. The 135 room 3-star hotel has been in soft-opening mode for several months already but recently completed its class-leading recreational facilities ready for the grand opening. The hotel now features a stunning swimming pool, gym and spa, as well as meeting room facilities capable of accommodating up to 200 people across six flexible meeting spaces for groups and events. The hotel sits strategically on Jalan Ronggolawe and offers easy access to downtown Surabaya and Jalan Darmo. In line with the Quest Hotel ethos, the hotel is geared towards a young, up-and-coming generation of business travelers looking for a proficient hotel at a reasonable cost, whilst also appreciating edgy interior design and a hotel poised with character. "The grand opening of Quest Surabaya is an important moment for us here at Archipelago International since the hotel is the third of its kind in Indonesia, joining our two other Quest hotels in Kuta â€“ Bali and Semarang â€“ Java. Next month we will be opening two more Quests in Denpasar and Balikpapan, whilst further Quest Hotels are being built in Jakarta, Cikarang and Sentul." Says Mr. Norbert Vas, Archipelago Internationalâ€™s VP Business Development & Operations. Surabaya is Indonesiaâ€™s second largest city and the capital of the East Java province. As one of Indonesiaâ€™s main trading ports and with its thriving retail sector, it boasts a large and diverse economy. Surabaya also offers many historical tourist attractions for visitors to the area, including old buildings from Dutch and Japanese colonial eras, and traditional art, dance, music and theatre displays. For the twenty-first century traveler, there are also a number of malls and shopping destinations with designer and boutique clothing stores. Seen in the image - From left to right Mr. Sugiarto Alim as President Director of PT. Marindo Surya, Mr. Norbert Vas as Vice President of Business Development and Operations, and Mr. Suwarjono as General Manager of Quest Hotel Surabaya. 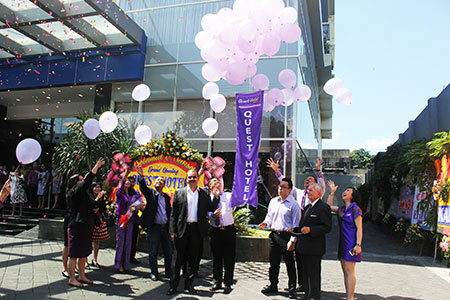 Seen in the image - Balloon released to mark The Grand Opening of Quest Hotel Surabaya done by Mr. Sugiarto Alim, Mr. Norbert Vas and Mr. Suwarjono.